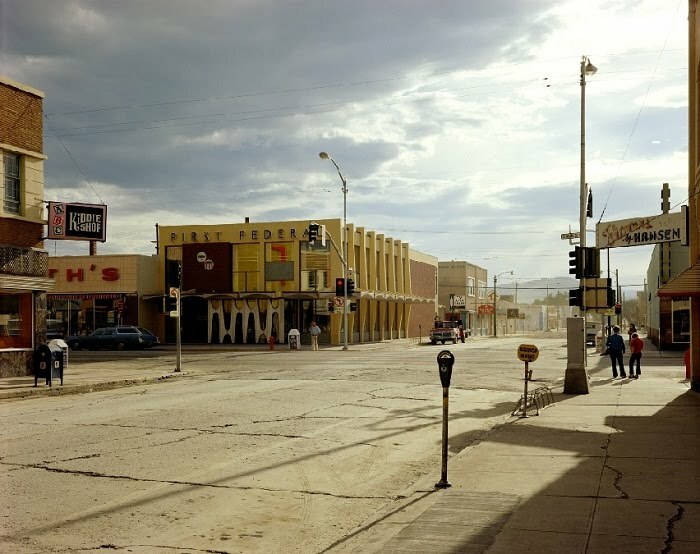 Most Montanans probably haven't heard of a photographer named Stephen Shore, but his work is well-known among fans of recent American visual art. Shore's photographs are noted for their strong use of color and for their careful, almost eerie depictions of everyday life. His most noted images were taken during a series of North American roadtrips in the 1970s, expeditions that included at least a couple of visits to Montana. Today's image is a photo Shore took in downtown Kalispell on a sunny August evening in 1974 ... this is the intersection of Second Street and Main, looking west. It's a striking and almost bleak image, with its saturated colors and near-empty streets. And even though 1974 doesn't seem all that long ago, almost nothing in that view looks the same today. The coolest thing in that photo by far is the old First Federal Savings building, a classic piece of early 1960s architecture if ever there was one. The building still exists today, but is nearly unrecognizable thanks to a recent hatchet-job remodeling ... enough to make any lover of architecture weep.